Consumerism: you can touch, but there isn’t much in there you can eat. It’s difficult to dispense with ironic quotation marks when you see armchair theologians using these catchwords. Words which were maybe meaningful, say, about a hundred years ago. What they don’t seem to know is how much the humanities have recognized they need to extricate themselves from the dead-ends of identity politics. Ironically, all the while, many seminaries are only now discovering these same intellectual trends and jumping at them as if they were the royal road to relevance. 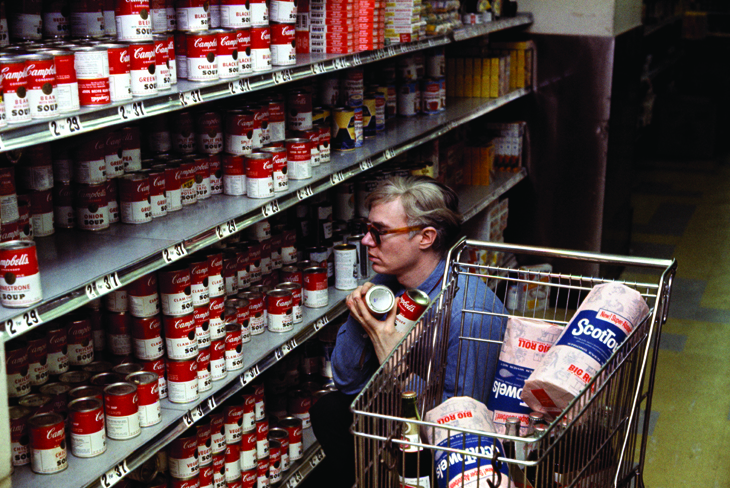 Nihilistic artists such as Andy Warhol are sometimes the targets of these, I believe, sincere attacks. They say it’s better that our children don’t get exposed to postmodernism if they are to keep their faith. 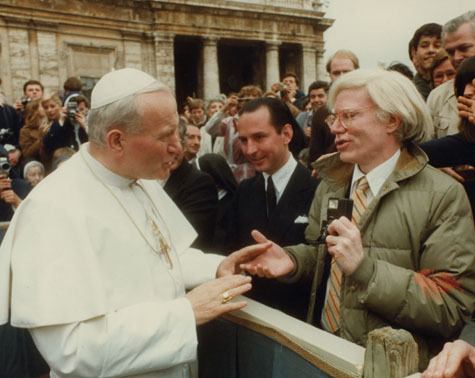 Yet, it turns out Warhol was a faithful Byzantine Catholic who participated in Mass frequently, carried around a missal and a rosary, financed a nephew’s studies for the priesthood, and might have remained a virgin all his life. Despite popular prejudices to the contrary these biographical details did discretely spill out into his art. He did a cycle of nearly 100 variations on the Last Supper, which the Guggenheim folks think “indicates an almost obsessive investment in the subject matter.” Or as I’d have it: devotion. Is there anything consumerism won’t absorb? To paraphrase Robert Musil: clean hands don’t necessarily imply a clear conscience. In my estimates, the painting above is a fine bit of iconoclasm, part of a long tradition of busting idols, going all the way back to the most riveting (and slightly embarrassing) episodes in the Hebrew Bible. It takes the hammer to our daily idols by transposing them upon the Real Presence they cannibalize. I know it’s not the most aesthetically pleasing work of art, but neither is the process of consumerist absorption it depicts. My line of reasoning gets even more twisted, more Rabelaisian, as I know from my own experience at a secular university. Even the most secular academic culture can bring up (and even answer) some of the ultimate questions that are at the heart of religion. By the time I was at the University of Washington I thought I had the boring paleo-nationalism of Polish-American Catholicism behind me. While majoring in history, Slavic, and ultimately comparative religion, I was fascinated by how much my professors deeply appreciated the artifacts of Christian culture, while doing their best to disarm the way of life and beliefs that stood behind them. There was obviously something dangerous about it. This got me thinking. And to make a long story short, I ended up reverting to Catholicism at a secular university. Some of this was the result of taking classes with outstanding Christian intellectuals such as Eugene Webb and James Felak. Herbert Blau’s bafflement keeps me on my toes and in the pews. But it wasn’t only the faithful remnant who taught me about faith. Actually, people who work outside of religious studies are given more leeway than those within them. It’s because they aren’t always required to bracket off the truth content of what they’re teaching. 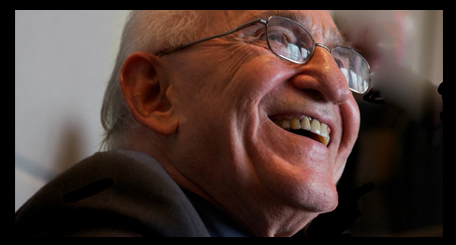 One prime example is the recently deceased professor of theater, Herbert Blau, an American theater pioneer who was a close friend of Samuel Beckett. I’m still reeling from his passing, because I miss his encouragement and the intensity he brought to teaching the importance of ultimate questions (to students who weren’t always aware they exist). His own inability to believe, perhaps his inability to accept grace, was one of the things that baffled Blau. He was willing to talk about it to whomever wanted to listen. The seriousness with which he took these questions would blow many a catechist out of the water. His influence keeps me going in trying to understand the Catholic tradition and its significance for my own life, my family, and our community. Perhaps the world and the academy are much more mysterious than we make them out to be? After all, we shouldn’t forget we live in a post-Christian culture where everything, even the very concepts anyone thinks in, are half baptized. Let’s be a bit more charitable toward it and call off the undertakers unless we want to saw off the branch we’re sitting on. Nota Bene: Don’t miss the Sartre and Camus installments in the “Famous Atheists Who Weren’t Atheists” series.